"Remember who you are . . . and where you left your reading glasses"
An all-class reunion will be held Saturday, April 27, 2019 from 11 a.m. to 2 p.m. at the high school. Details and a reservation form can be viewed and downloaded. Only persons who want to eat the catered barbecue meal need to make a reservation. Our summer gathering for 2018 was held August 4 at Cousin's BBQ in Crowley. We had a good turnout with lots of familiar faces and a few less-familiar faces. Creating a slightly dangerous atmosphere were these hombres: the Magnificent Seven Fourteen. Top row: Steve McQueen, James Coburn, Horst Buchholz, Yul Brynner, Brad Dexter, Robert Vaughn, Charles Bronson. Photos, video, and more on our fifty-year reunion. Our 2016 Summer Dinner Is, Like Mr. Clark, History Fifty classmates--lots of regulars, some new faces--attended our annual summer dinner August 27 at Cousin's Bar-B-Q in Crowley. Among those in attendance were the Magnificent Seven. More photos here. Gary Pillers, Roger Ray, Roy Lowry, Ray Kelley, Rick Lawlis, Robert Beasley, James Anderson. The Class of 1967 Now Has a Page on Facebook We now have a Facebook page at Poly 1967. 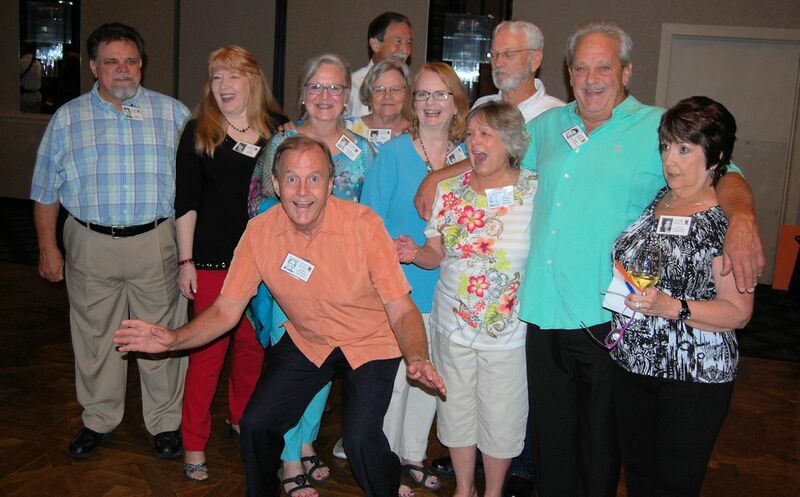 2015 Summer Dinner Was a Winner, Hands Down The Poly High School class of 1967 held its 2015 summer dinner August 22 at No Frills Grill in Burleson. To see who all these hands were talking to, click here. 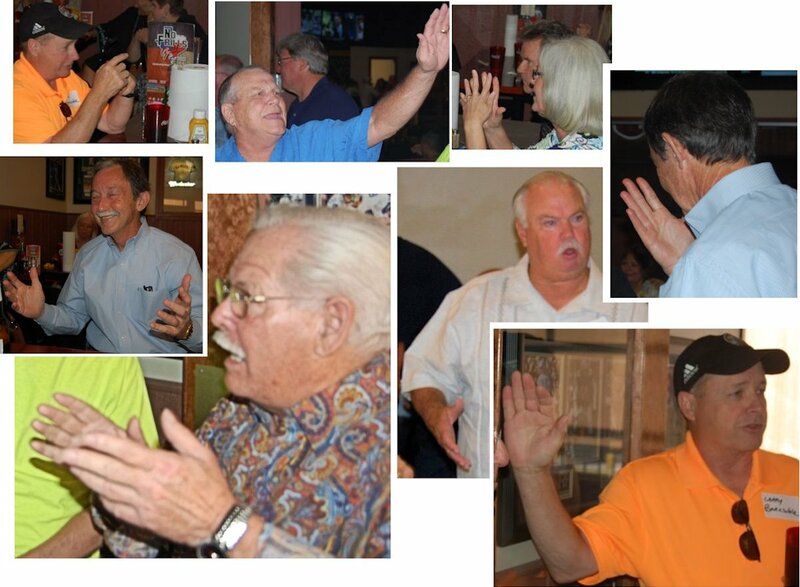 2014 Class Dinner: Come One, Come Al The class of 1967 held its annual dinner October 15 at Cousin's BBQ in Crowley. In addition to the usual good food and fellowship, this dinner included a rare sighting of the California parrot, Al Reader. Bottom row: Jerry Martin, Roy Lowry, Al Reader John Morrow, Allen Koenig, Bill Sims, David Tarrant. 2013 Class Dinner: Food, Fellowship, and the Magnificent Seven Fourteen The class of 1967 held the second of its twice-yearly dinners October 26 at Cousin's BBQ in Crowley. More photos here. Bottom row: Bill Ayars, John Morrow, Jerry Martin, Steve Burris, Larry Barksdale, Danny Matthews, Ken Zielinski. Photos From Our 2013 Summer Dinner The first of our twice-yearly get-togethers for 2013 was held on May 18. Here are photos of some of the guilty parties. 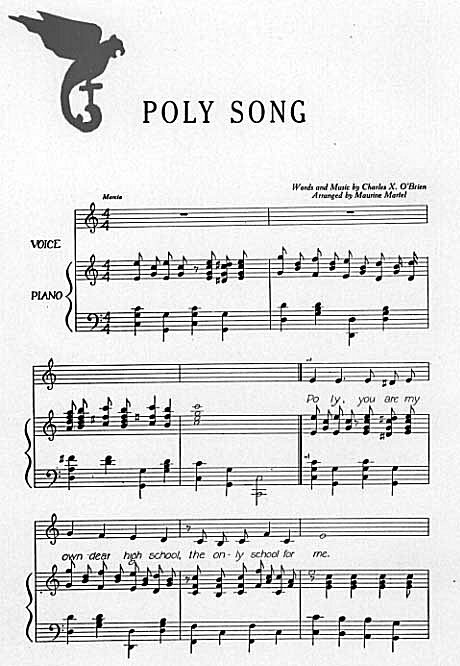 Happy Hundred: Coming Home to "Where You're From" Poly High School now has a second marching 100 to remember: One hundred years have marched by since its first graduating class in 1912. To celebrate, on October 6 the centennial reunion drew about 2,300 former and current students and teachers. We filled the halls and shook the walls. The reunion was an incredible gathering, a Woodstock in orange and black. Thanks to Rita Morris Vinson and Judith Simpson, who over several months supervised the organization of such a monumental event. More photos and video clips here. And if you want to order a DVD of video shot at the centennial reunion and/or a CD of the "Poly Blues" and the alma mater, a form is here. 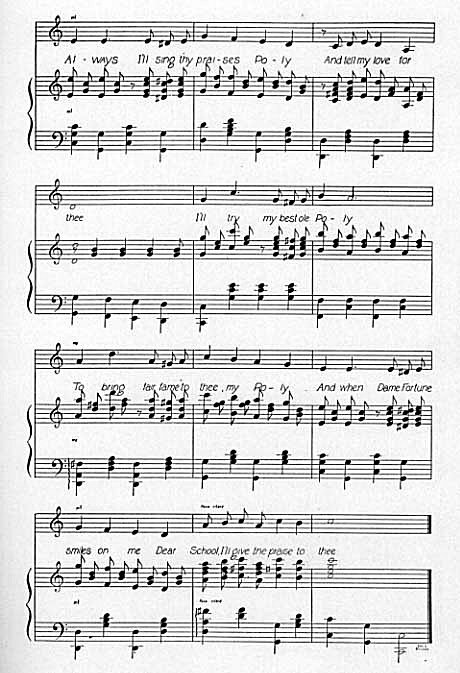 The CD of the "Poly Blues" and the alma mater is made from the original 1952 78 r.p.m. record that was digitally remastered about four years ago. You may pay for all of these items with one check by using the order form as long as all items are mailed to the same address. If you want to order the DVD and/or the CD as a gift that you want the school to mail to a different person/address, fill out a separate form and a separate check for each person/address, and you will need to let that person know you have ordered the DVD and/or CD for him/her. The school will not be responsible for noting gift acknowledgments. Our Forty-Fifth Class Reunion Our forty-fifth class reunion was held on September 8, 2012, in the Stockman's Club at Stockyards Station. 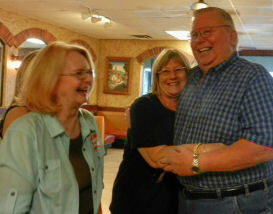 It was quite a roundup: more than eighty classmates, some, such as Al Reader and Steve Lefler, from out of state. Photos of our forty-fifth reunion are here. Our 1967 Yearbook Is Now Online Click on this link to see our 1967 yearbook. Time Marches . . . Backward--to 1965 This YouTube video shows the Poly Marching 100 at the 1965 University Interscholastic League band competition at TCU. You Must Be Weird, or You Wouldn't Be Clicking on This Link Remember when "hip" was an attitude, not something that you fall and break? Phil Vinson, class of 1958, has found a short video about the Cellar on YouTube. The "Related Videos" menu includes other videos about the Cellar and even a video about Jacksboro Highway. Papa Parrot: The Man We Called "Mr. T"
Once Upon a Crime: Of Bombs and "Boomerangs"
A Toast to the Ghost of Paul Hollis and "Good Old Poly Pop"
"Poly, You Are Our Own Dear [Third] High School"
Suitable for Framing: A Picture-Perfect Crime? Cobb Park in Its Prime (Part 1): A "Maze of Beauty" and a "Lovers' Lane"